A strong West wind and 9 - 12 ft. seas kept everyone on shore once again. Several boats are preparing to fish tomorrow, so check back to see transpires. Heavy rain and gale force winds kept things quiet here at the marina today. No boats fished - inshore or offshore. We will be open next week and are looking to book charters during Thanksgiving week! Complete your feast with fresh fish! Give us a call at 800-676-4939 and we'll hook you up. Day started out chilly with temps in the 50's and warmed up as the day went on. The sun didn't really make an appearance today. We had both Inshore and Offshore boats out fishing today. Inshore boats found Speckled Trout and Bluefish. Offshore found excellent Blackfin Tuna and some King Mackerel with citation sizes for both with a few Dolphin. Bite Me: David Zincon of Manchester, MD caught a 21lb Blackfin Tuna.Tony Craig of Littlestown, PA caught a 25lb Blackfin Tuna. Dwayne Brown of Hanover, PA caught a 27lb Blackfin Tuna. Release: Carlton Bivens of Chesapeake, VA caught a 39lb King Mackerel. Ellis Sivels Jr. of Chesapeake, VA caught a 34lb King Mackerel. Nathaniel Howard of Smithfield, VA caught a 35lb King Mackerel. But yet another blow day! The weather is not cooperating as far as fishing is concerned. As this pattern moves off a cold front is scheduled to arrive bringing the first cold blast this Fall. Fishing may be possible sometime at the beginning of next week. Another blow day kept everyone on shore today. The wind will be out of the north for the next few days keeping the water choppy inshore, with a big swell offshore. Mild temperatures and calmer seas allowed charters to get out and about today. 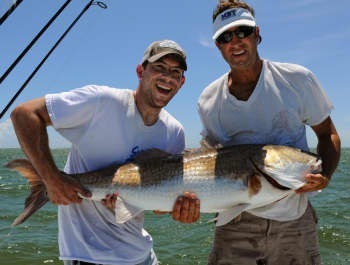 Inshore anglers got on a good Red Drum bite with keepers and releases. What fun to catch them on light tackle! One boat fished near shore and returned with Bluefish and King Mackerel. Offshore charters finally got out to the Gulf Stream and experienced a good Blackfin Tuna bite along with scattered Wahoo. 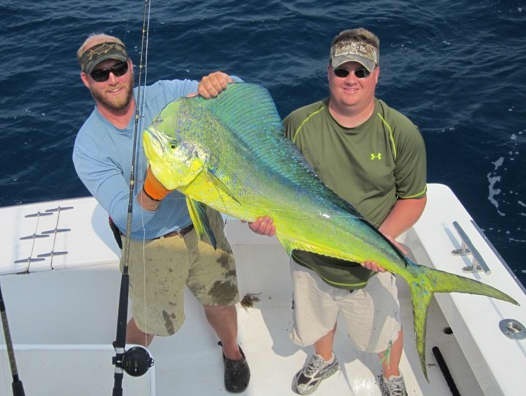 Looking for a diversion this fall, come to Hatteras and experience some world class fishing. Give us a call at 800-676-4939 for more information. Richard Cole of Stuart, VA; 25 lb. Blackfin Tuna on Release. William Clark of Stuart, VA: 25 lb. 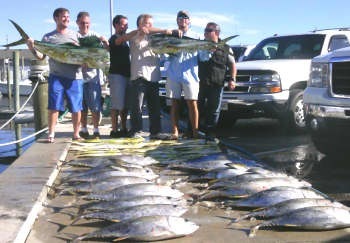 Blackfin Tuna and 45 lb. Wahoo on Release. Despite temps in the 80's and bright beautiful day we did not have any anglers that wanted to come play with us. Boats stayed at the docks today. Quiet and rainy in Hatteras, not what we were looking for on a Monday! No boats fished Inshore or Offshore. Hope to see weather improve over the next few days. A couple of boats fishing Offshore today. 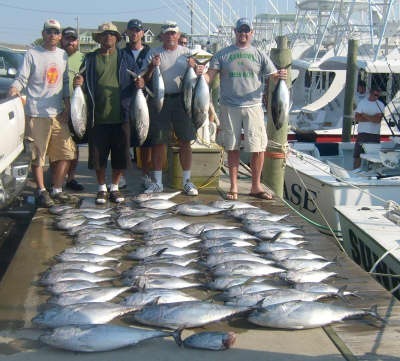 They returned with excellent Blackfin Tuna, good Wahoo and King Mackerel. There was also a Sailfish boated on Bite Me. Sound was pretty choppy and no one fished Inshore. Lots of T-Shirts on sale for 30% off come check it out! No news on fishing as no one went out today. Gusty winds and big seas kept the fleet in again. Looks like the weather might clear out for a couple of days at the beginning of the week. We'll have to wait and see!